This week's Sunday Night Suds looks at Samuel Adams Honey Rye Pale Ale. 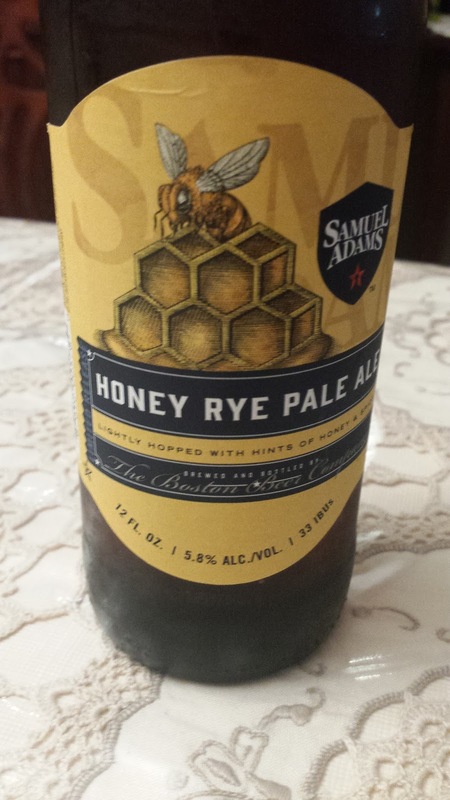 With Rosh Hashanah around the corner, what better time to review a "honey" beer. I use the quotes around honey since this beer is not actually brewed with honey as the honey is the species of malt. (If you are looking for a beer which is actually brewed with honey, pick up some Blue Moon Summer Honey Wheat --reviewed here http://kosherbeers.blogspot.com/2008/05/sunday-night-suds-blue-moon-honey-moon.html). The Honey Rye Pale Ale poured a deep maize (for those who remember that Crayola crayon color). There is some sweetness in the foam and in the beginning of the sip, but there is considerable rye bitterness which gives this beer an interesting after taste. There is a bit of citrus and hop bite which reminds you that this is a Pale Ale, but its certainly not a strong Pale Ale. The beer has a 5.8% abv, which is about average to low for the style. The Honey Rye Pale Ale is a seasonal limited release and there are two bottles of it in the Beers of Fall Variety Pack. I swapped my other to my good friend and home brewer Dan R, and picked up some other interesting Sam Adams products which I will iyh review over the newxt few months. The Samuel Adams Honey Rye Pale Ale is under the Kosher Supervision of the Star-K and has a Star-K certification mark on the bottle. To see what the experts on Beer Advocate think about this brew, please follow this link - beeradvocate.com/beer/profile/35/279354.